Believe it or not, earlier this season college basketball analysts were gushing over the Bearcats. Cincinnati won 12 straight games to start the season. Junior sharpshooter Sean Kilpatrick couldn't miss from long range, and was getting early recognition for the Big East Player of the Year Award. Since then, Cincinnati is just 8-9 with their best win coming against then-24th ranked Pittsburgh. 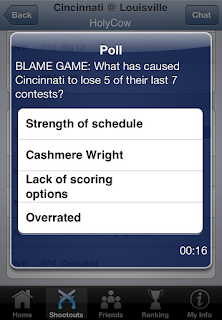 We polled our SnapCall audience to find out what has caused Cincinnati's inconsistent play. For all of you new players: “Blame Game” questions offer our audience a chance to pick a scapegoat. You get to put your analyst hat on and tell the world why this team is underperforming. Then we broadcast the audience response percentages for each choice. Starting from the top, we've got a tricky one to select. In the always tough but soon to be dissolved Big East Conference, Cincinnati is forced to square off against elite competition on a nightly basis. Their most recent five losses, in chronological order, came at Providence, vs. Pittsburgh, vs. Georgetown, at Connecticut and at Notre Dame. Sure, there's an argument to be made that Syracuse and Georgetown were close losses, but UC fans expected different results from this veteran squad. One or two of these wins may have cured Cincinnati's Bracketology ills. Next, let's look at Cashmere Wright. There's no way around it: Wright has been wrong. Entering Monday night, Wright is 25-of-109 (23%) in his last 10 games since suffering a knee injury vs. DePaul. Wright's struggles bring us to our next option: Lack of scoring options. Sean Kilpatrick scores 17.7 points per game, but has proven that he can't carry the team on his back. He doesn't get much help either, as Cincinnati's top three scorers provide over 60% of their total points. Also, the Bearcats assist on only 13 baskets per game, therefore UC can't rely on ball movement to get easy looks, and are often forced to resort to isolation scoring. When Kilpatrick is off his game, they're in trouble. 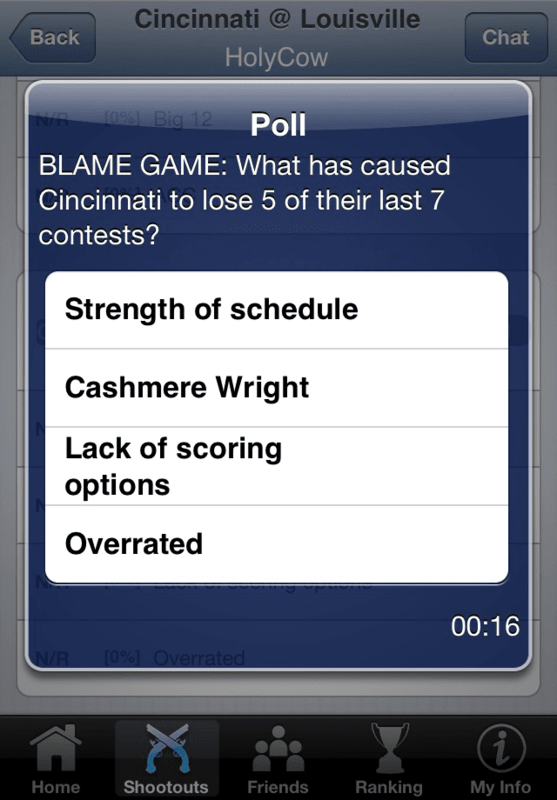 Lastly, there's always the option that Cincinnati just isn't as good as analysts predicted. The eye test never fails, and this doesn't appear to be a team that can win six straight games come tournament time. Maybe we're reading too much into their play when really, they're just not all that talented. Have your own opinion? Download SnapCall Sports on the iTunes App Store to play along!